The roads crew brought home the hardware in four team categories on Sunday at the RRCA Club Challenge 10 Mile, including Overall Coed, Overall Female, Overall Male, and Female Under 40. 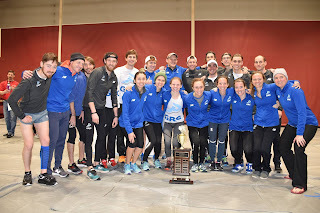 The track crew was in action on Sunday as well, bidding indoor track farewell at both the George Mason Last Chance Meet in Fairfax, VA, and the Fastrack Last Chance in Long Island, NY. Much further south, the splinter cell "Panhandle Crew" went 1-2 at the Pensacola's Finest Relay 5k in Florida. Most of the track crew spent a snowy Saturday inside the bubble up in Princeton, NJ. Social media suggests that the highlight of the meet was Jesse's dominant victory over her younger sister. Down in North Carolina, Stalnaker notched a comfortable victory in the 3k and moved into 2nd on the GRC All-Time list. Coach Jerry recapped the underdog story of the men's DMR victory at Millrose on the Pacers blog today. Hit the link for the scoop, and don't forget to smash that "like" button. 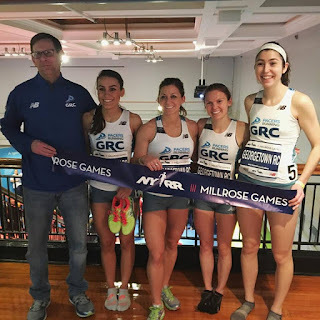 Weekend Preview: Millrose Magic Strikes Twice? 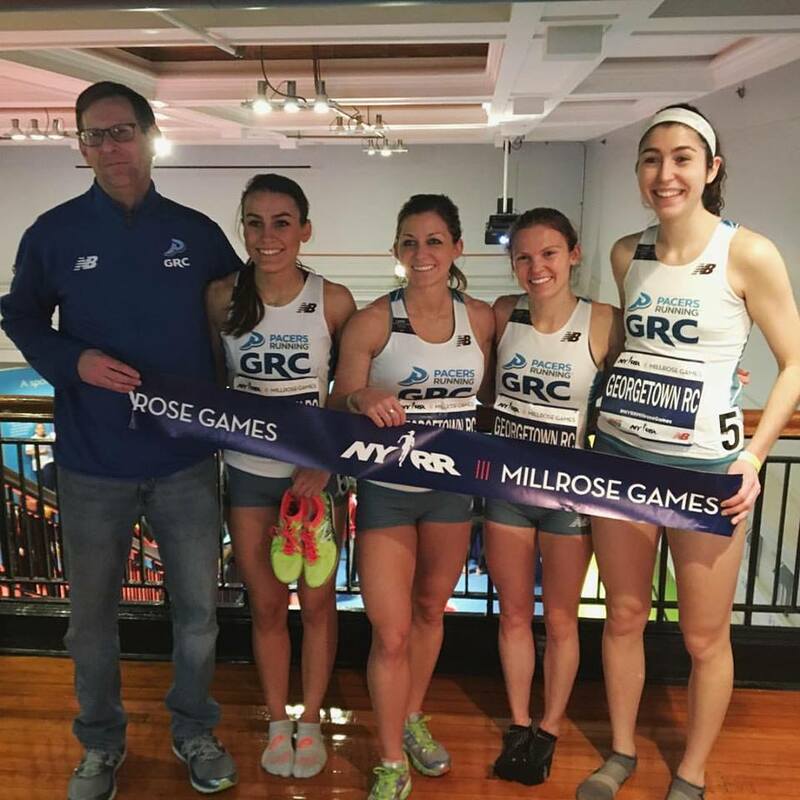 One year after claiming victory in the Club DMR at the illustrious Millrose Games, the GRC women are aiming to defend their title tomorrow morning in NYC. Unlike last year, the women will have two shots at victory this time around. That's how you diversify risk, folks! Relay 1 will consist of Gina (1200m), Alex (400m), Jesse (800m), and Taylor (1600m), while Relay 2 will include Alyson (1200m), Jackie (400m), Liz (800m), and Maura Linde (1600m). Coach Jerry is bullishly optimistic at the prospect of a repeat victory. "While the field looks to be much more difficult this year," he explained, "we won't relinquish the title without a fight." The guys are also joining in the fun this year, with Stewart (1200m), Craig (400m), Daniel (800m), and Paul Thistle (1600m) fielding a squad in the men's race. Victory might not come as easily for this group, but Coach Jerry still sees potential in the crew. "They're hoping to finish in the top half of a very competitive field," he reports. A few miles to the south, our resident Marines Sean Barrett and Lucas Stalnaker are taking another crack at cross country at the USATF National XC Championship in Tallahassee, FL. Coach Jerry has the scoop on our Florida-based star: "Lucas is rounding into excellent shape, and he's looking for a measure of redemption in xc after what was, by his lofty standards, a disappointing performance at Clubs. The field is loaded, and he'll have a chance to take some impressive scalps if he can stay patient early."